In 1987 Acorn launched a new series of machines that was a radical departure from the BBC Micros Acorn made its name selling. The significant performance increase was down to a fundamental architecture change from the 6502 models that came before. Acorn designed a new RISC processor, the ARM, inspired by the RISC (later SPARC) and MIPS work of Berkeley and Stanford Universities and produced after a visit to the Western Design Center (WDC) had convinced them of the relatively easy work of designing the architecture. Acorn also developed new Video controller, memory controller and IO controller chips to support this new CPU. At its core the new 'Archimedes' machines were based around the new 8MHz ARM2 processor (the ARM1 had only been used for testing and in a second processor unit for the BBC Micro). Testing and benchmarks placed its performance way in advance of the venerable 1MHz 6502. Graphical and sound power was also a giant step forward over the BBC micro. 256 colour modes (from a palette of 4096) and 8 channel 8-bit stereo sound. Memory was increased dramatically, even the lowest Archimedes, the A305, shipped with 512KB of RAM, 4 times that of the BBC Master. Unfortuanately the price was also a giant step forward over the BBC micro too. Launch prices of the first Archimedes range, the A305, A310, A410 and A440 were £799, £999, £1399 and £2299 (excluding VAT and monitor). The Archimedes initially shipped with the Arthur operating system, but this was renamed to RISC OS for version 2 onward, and later machines shipped with that. In 1989 the A410 and A440 were replaced with A410/1 £1199 (ex VAT), A420/1 £1699 (ex VAT) and the A440/1 £2499 (ex VAT). 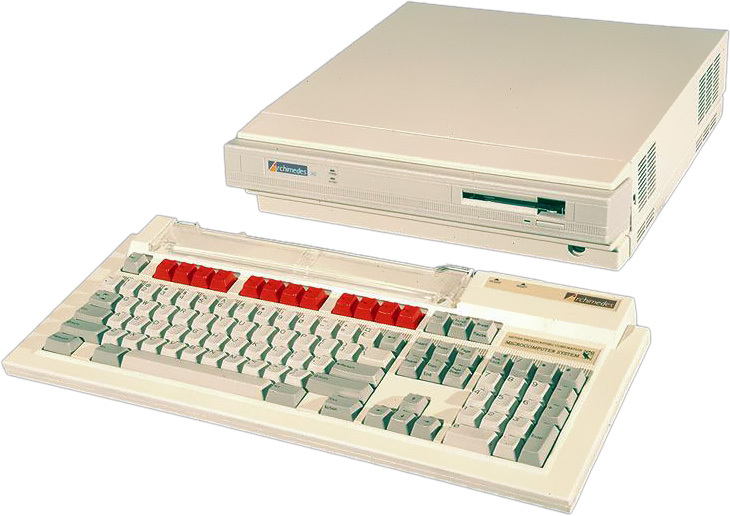 The A3000 was a single-box solution (built in keyboard) that reduced the expansion capabilities of the Archimedes to create a budget machine. It launched at £649 (ex VAT) but rapidly dropped to £599 (ex VAT). The Archimedes expansion of 4 podules was replaced with 1 internal mini-podule and 1 external podule. It was also the first machine to ship with RISC OS (2.00) as standard rather than Arthur. In 1990 Acorn managed to combine the new ARM3 processor into the Archimedes. The A540 model was expensive, £2495 (ex VAT), but very very fast. The CPU clock speed was increased from 8MHz to 25MHz and the addition of on-processor cache memory offered performance that briefly kept Acorn machines ahead of the PC competition of the time. The ARM3 was made available as a upgrade for all previous Archimedes, the A300, A400 and A3000 machines, from companies such as Simtec, Aleph1 and Watford Electronics. Acorn also attempted to sell their Archimedes hardware with a BSD UNIX based operating system on called RISC iX. Designed for the UNIX workstation market they carried an eye-watering price tag, which would have only seemed cheap in comparison to their UNIX competitors. They shipped with Ethernet networking and a hard disc (ST506 or SCSI) as standard. The R140, based on the A440, cost £3500 (ex VAT) and the later R260, based on the faster A540, cost £3825 (ex VAT). Unfortuanately, so far, no RISC iX emulation solution is currently available. In 1991 Acorn set about updating the range and subtly tweaked the architecture. The separate floppy disc, hard disc, serial and parallel port chips were replaced with a PC style 'Super IO' chip. 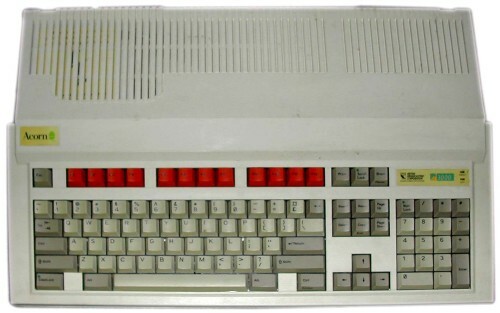 The A5000 was released first, though it was itself an offshoot of the Acorn A4 portable project. The A5000 featured the faster ARM3 processor as standard and at £999 or £1499 with a hard-disc (ex VAT) was considerably cheaper than the previous fastest model the A540. The A5000 was also the first machine to ship with RISC OS 3, initially the buggy 3.00 but later the stable 3.1x. 1992 was a busy year for Acorn. The portable A4 was released, Acorn's only laptop also featured the faster ARM3 with prices from £1399 and a budget range was released based around the ARM250. The ARM250 was an early example of a System-On-Chip that combined the slower ARM2 core, Memory Controller, Video Controller and IO Controller onto one piece of silicon. Acorn produced three machines based around the ARM250 aimed at different markets. The office based A4000 was a three box solution with separate keyboard. 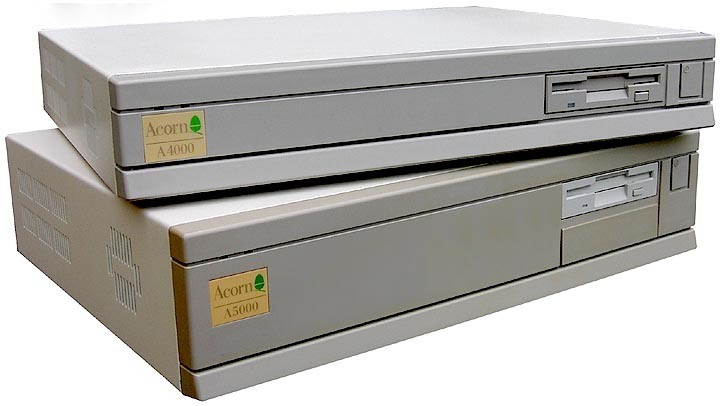 The education focused A3020 and home targeted A3010 replaced the A3000 in Acorn's Range. The A4000 cost £949 (ex VAT) with a 80MB hard disc, the A3020 was £749 (ex VAT) with a 60MB hard disc. The A3010 was launched at £499 (inc VAT) and later was reduced in price to £399, this was the cheapest Acorn ever managed to release a 32bit machine at and, at its lower price, finally matched the prices of the BBC micro. The Archimedes was initially supposed to ship with an OS called ARX, but its development was running very late and its performance was underwhelming. To counteract the ARX delays Acorn started a second OS project called 'Arthur' with a mandate of 'make it like the BBC'. So what you got was a single-tasking command line OS that worked with star commands and a copy of BBC BASIC. By the time of the Archimedes launch Arthur had gained a primitive task-switching GUI with a truly disturbing colour scheme. There were a couple of publicly released versions of Arthur in 1987, 0.30 in June and 1.20 in September. For version 2 (Oct 1988) Arthur was renamed RISC OS. RISC OS features an update to the GUI to enable co-operative multitasking of applications and a much more restrained colour scheme. Version 3 (3.00 Sep 1991 and bug fixed 3.10 Apr 1992) followed with many improvements including multi-tasking filer operations, task windows alolwing multi tasking of some single tasking programs. It was also modified to support internationalisation, with a German language version 3.19 being released in June 1993. The latest OS supported by this level of hardware is OS 3.1x, though a fair amount of later functionality can be soft-loaded over the top. Including a much more advanced window manager which supports anti-aliased system fonts and background window tiling, this is available in the Universal Boot.